WASHINGTON (CNN) -- California will have to make "severe cuts now," after voters rejected a handful of ballot measures designed to pull the state out of a deepening budget crisis, Gov. Arnold Schwarzenegger said Wednesday. 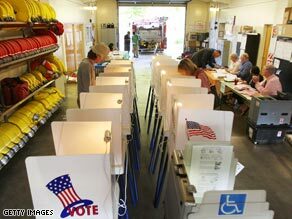 Turnout at polling centers in California was relatively sparse for Tuesday's special election. The cuts, he said, will have to take place in three areas: education, health care, and law enforcement. "There will be around $5.3 billion in additional cuts in education, there will be severe cuts in health care, which is another area where ... we spend a lot of money, and then, of course, you have to go and look in other areas, like prisons," Schwarzenegger said after meeting with U.S. Health and Human Services Secretary Kathleen Sebelius. He plans to leave Washington on Wednesday and head to Sacramento, California, for talks with state leaders. Californians voted down five of the six propositions in a special election Tuesday. More than 60 percent of voters opposed each defeated measure, according to final tallies Wednesday. If all six measures were defeated, the deficit would surge to $21.3 billion, Schwarzenegger's office said last week. Even if all the measures had passed, the deficit was projected to hit $15.4 billion at the start of the new fiscal year in July. Schwarzenegger had warned that without budget relief from voters, he may have to shorten the school year by a week and a half, cut tens of thousands of education jobs, eliminate health insurance for nearly 250,000 needy children, lay off 1,700 state firefighters, and withhold $2 billion from local governments, which in turn could trigger cuts in law enforcement and other services. Many of those inmates include "undocumented immigrants" that Schwarzenegger said would be "handed over to the federal government, federal authorities, because that would save us $180 million." But that plan worries some, including Lance Corcoran of the California Peace Officers' Association. "The reality is that people don't get to the California prison system by accident, and most of our offenders have nine felony convictions before they have ever seen the inside of the prison," Corcoran said. "There is concern that we are just dumping people back into communities and those communities are going to be at risk." Officials had expected low turnout for the special election, with some voters expressing political fatigue, while others were put off by the complex issues. A CNN photographer spent two hours waiting for voters at two polling places in Los Angeles on Tuesday morning, and encountered just one. The one ballot measure that passed was a provision that prevents certain state officials from receiving pay raises when California has a budget deficit. The other measures would have capped government spending, protected education funding, changed the state's lottery and redirected money to children's health programs.